With more than 700 islands and many more cays, the Bahamas have a whole lot of coastline. Unsurprisingly, the archipelago is home to countless beautiful beaches, so choosing which palm-lined stretch to spend your day on can be difficult. Here’s our list of the best beaches in the Bahamas. Pig Beach is popular not just for its good looks—though it is indeed picturesque—but also for its animal inhabitants. A drift of wild pigs who live on the uninhabited Big Major Cay in the Exumas can often be seen paddling through the waters just offshore. Tours take visitors out to swim with the swine. Located within the protected Lucayan National Park, on the island of Grand Bahama, Gold Rock Beach has azure waters, white sands, and a tree-lined shore—all the features of a paradise beach. It’s best at low tide, when the shoreline extends far out into the water, leaving sun-warmed shallows ideal for wading. This Atlantic-facing beach is one of the most attractive and popular on Nassau and Paradise islands. Take a dip in the water, stroll barefoot on the sands, and lay out under the Caribbean sun. Alternatively, opt for more active pursuits such as snorkeling, parasailing, and waterskiing. If it’s seclusion and silence you want, then the sandy beach of uninhabited Rose Island, situated west of Paradise Island, fits the bill. Find a shaded spot on the sand to soak up the picturesque and peaceful surroundings. 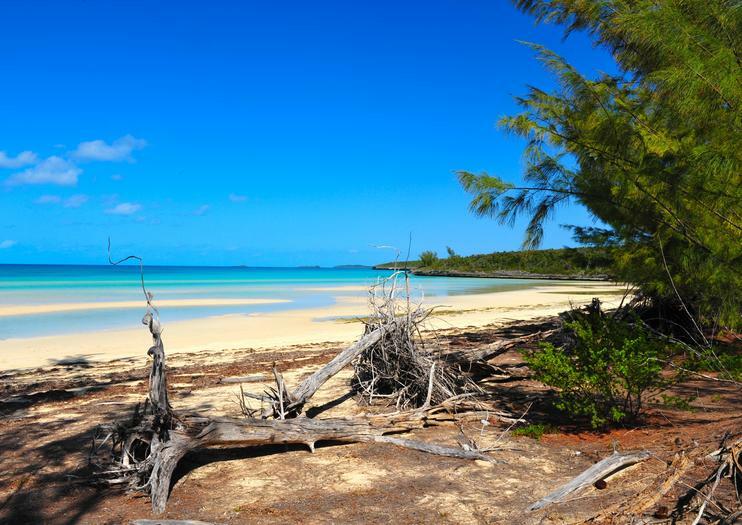 This golden-sand beach near Freeport provides access to Deadman’s Reef, one of the best snorkeling spots in the Bahamas. Don your flippers and look beneath the surface of the turquoise waters for schools of tropical fish, stingrays, and even sea turtles. Allen Cay in the Exumas is famous for its reptilian inhabitants. Allen Cay iguanas, a subspecies of Bahamian rock iguanas, can be seen hanging around the beach here, padding quietly across the sands. The clue is in the name. Pink Sand Beach on Harbour Island is known for its peachy-hued sands, which turn even more rosy under the fiery sunset. The sand’s pink tint is derived from finely ground coral. In recent years, the Bahamas’ swimming pigs have earned international fame—and this full-day, private tour offers one of the easiest ways to get acquainted. Following cab pickup from your Nassau hotel, hop aboard a chartered flight: it’s just a half-hour journey to Exuma. Take a quick boat trip to Pig Beach, where you can meet the pigs and share some treats; other stops will also let you glimpse sharks and iguanas in their native habitats. At the end of the tour, board your return flight to Nassau. If you've ever seen photos of pigs swimming in crystal-clear Caribbean waters, then you've likely seen the Bahamas famous swimming pigs. With this tour, you'll get to head out to the Exumas to see the pigs up close and personal, with options to feed iguanas and even swim with sharks! Are you coming into Nassau on a cruise and looking for options to get to the swimming pigs? Are you a family who just prefers a more exclusive option or you just want to have the flexibility to choose what you see and when you see it? Then this tour is the perfect option for you!This tour includes privately chartered flights from Nassau which allows you to see the beautiful Exuma Cays at your own time and on your own pace. Customize your tour to best fit your schedule! Transfers in Nassau also included.Highlights: Swimming Pigs at Pig Beach, petting sharks at Compass Cay, a beautiful sandbar, indigenous iguanas, snorkeling in Thunderball Grotto and a sunken plane. You can choose which attractions you want to see and what you want to skip, just let your captain know! Join on this private, full-day charter onboard the 38ft Reel Dreams. You are in control so you can fully customize your charter to fit your needs. You're able to choose any combination of activities that fits you best, including deep sea fishing, in-shore/light tackle fishing and snorkeling and beaching. Soar over the turquoise waters and white sand of Cabbage Beach on Paradise Island on this parasailing excursion. No experience is necessary and outings are available every half hour to suit your schedule. Hotel and port pickup and drop-off included. Get personal attention from the crew and enjoy a flexible itinerary on this private boat charter from the Bahamas. Once aboard, get views of the coastline and epic photo ops, then choose from a long list of activities. Take advantage of the boat's fishing equipment for some deep sea action, go snorkeling, or hop from beach to beach. One or two activities fits in the customizable half-day itinerary. This glass-bottom boat tour is great for nature lovers or those who simply want to take it easy and enjoy being on the water. The tour begins with cruising the inland canals around Freeport. Later, head out to the open ocean where the crew points out a variety of marine life, including sharks, which you can watch being fed by the crew. Spend a half-day on the ocean fishing aboard a private boat from Nassau. Board a 35-foot (11-meter) Allman boat with a private captain who can adapt the itinerary to your interests. Cruise into deep waters or fish over shallow reefs. Stop to snorkel, swim and sightsee wherever you like. Whether you are an experienced fisherman or a newbie to this sport, your crew will offer as much or as little assistance as you need. No licenses or permits are required; bait and tackle are included. Explore the Bahamian waters and their abundant marine life during this snorkeling activity from Cabbage Beach. All equipment, instruction, and round-trip transportation from Nassau hotels or the cruise port included. Sail along the Bahamian coast aboard a deluxe, 50-foot (15-meter) sailboat on this all-inclusive adventure. Anchor at a reef and spend time snorkeling, stand-up paddling, or simply relaxing on board. Your captain prepares a lunch of fresh seafood, pastas, salads, and fruit, which you can enjoy accompanied by an open bar. Pickup and drop-off at most Freeport hotels is included. This combo tour features an exciting jet boat ride along Nassau's coast with relaxation time at Jimmy Buffet's Margaritaville. Spins, twists, and turns await you aboard the 15-passenger jet boat while your captain motors you past oceanfront mansions and historic sights. At Margaritaville, swim in the fin-shaped pool (don't forget to pack a bathing suit), and enjoy included lunch at this festive restaurant. Multiple departure times during the day accommodate your vacation schedule. Tour departs within walking distance of cruise terminal. Get off the beaten path on a 4-hour tour from Nassau by UTV (utility task vehicle). With a guide, you'll shake, rattle, and bump along a scenic road, passing by historical and cultural sites before arriving at a beach for snorkeling. Lunch and a beverage are included at a local restaurant. Snorkeling gear is not included. Explore the Bahamian waters on a jet ski during this full hour rental from Nassau. Can accommodate individual riders or couples; hotel and port pickup and drop-off included.